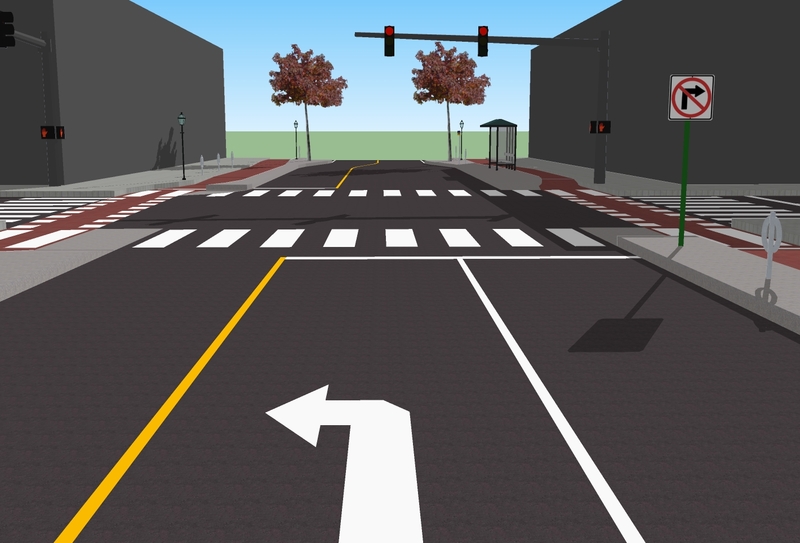 In order to demonstrate how separated bicycle lanes could work on King Street between Erb and Central Street, I have made a model of King and Erb, one of two major intersections in the study area. The other is King and Bridgeport, which is nearly identical but rotated 180 degrees. 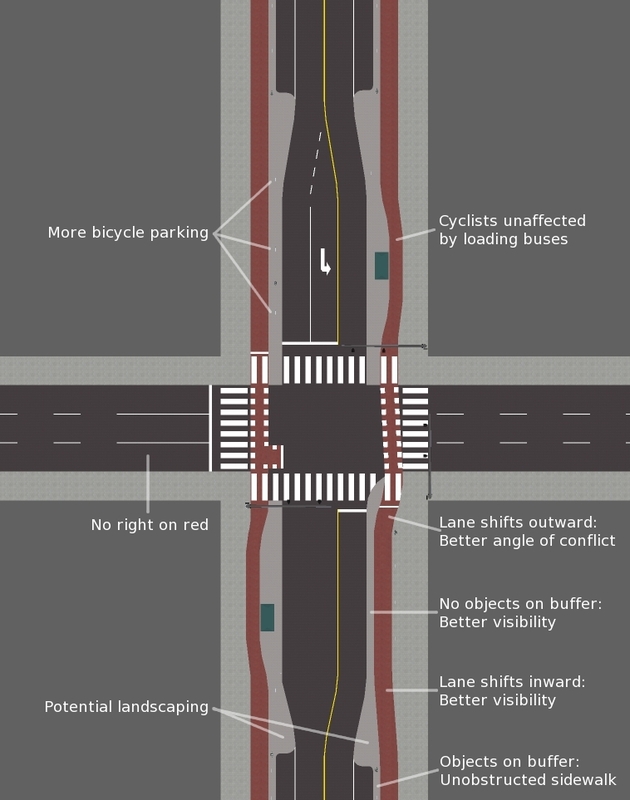 As the northbound bicycle lane approaches the intersection, it moves closer to the roadway to improve visibility of cyclists, and no objects are placed on the buffer between the bike lane and car lane. At the intersection, the bike lane curves away from the street in order for to make a better angle of conflict between right-turning cars and cyclists. If the bicycle lane continued straight, cyclists would be approaching right-turning cars in their blind spots. These measures are not taken for the southbound lane since Erb is one-way eastbound so there are no turns across the bike lane during a green light for King. The bike lane is also paved in red asphalt to make it more obvious to drivers and pedestrians. The bicycle crossing is shown with “Elephant’s feet”, a series of squares marking the path of bicycles through the intersection. The bicycle lane has a width of 2.0 metres, which is the absolute minimum width to allow a faster cyclist to overtake a slower one within the lane. The exception is behind the bus stop, where it narrows to 1.5 metres in order fit in the bus platform. Cyclists would have to wait to overtake until after the bus stop. Where the bike lane is adjacent to parking, the bicycle lane buffer is 0.8m which is just enough to completely protect cyclists from opening car doors. The bicycle lane passes behind bus stops to completely separate buses from bicycles. Cyclists can pass the bus stop even when buses are loading passengers, thanks to the island platform. 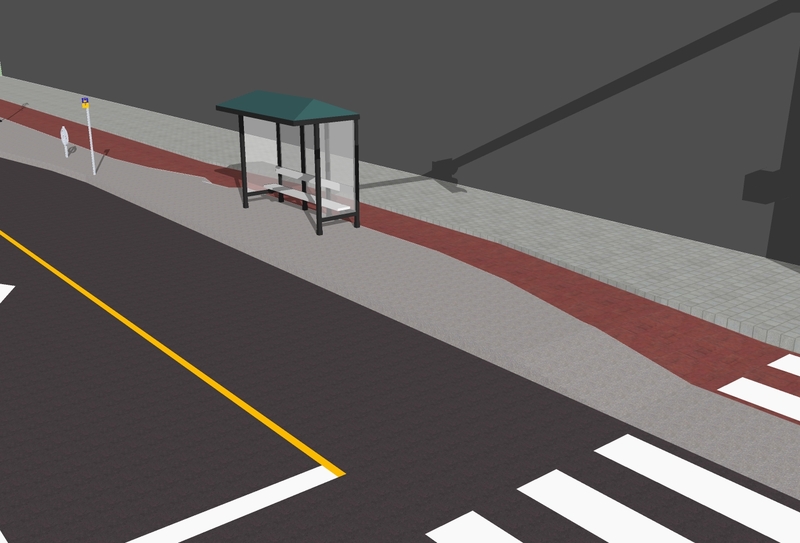 In order to maintain visibility for cyclists approaching the intersection, bus stops need to be on the far side of the intersection. The southbound stop has a wide enough lane that cars can pass stopped buses, but the northbound stop does not. What do you think of this vision of King Street? PS. Feel free to use the images in this post for any purpose, with or without accreditation. Narayan, fantastic work, I’ll be sending this off to Barb tonight! Great work! I have two concerns, though. First is that the bicycle lanes will become wasted space during the winter. I guess it’s a trade-off, and maybe if it’s maintained, the hard-core cyclists will keep using it. Second is about the sidewalk. Is there enough room for pedestrians? But aside from that, I think its a great design. Which begs the question, why wasn’t this thought of by the team at city hall? @Seth – why would they become wasted space? Are sidewalks wasted space in winter? I would use them (if they are cleared!). I have biked to work in all week this week (windy and snowy), including dropping off my two-year-old for childcare and I plan to do so all winter (it will be my first winter cycle-commuting, but we moved into downtown from Baden so that we could bike places, and bike places we will!) If well-designed bike lanes exist, people will bike more. It takes longer for me to scrape off my car and then sit in it waiting for the engine to warm up than it does for me to don longjohns and gloves and arrive at work on my bike. Plus, I get to park right out front on my bike instead of a few blocks away. @Narayan and @Graham Roe – could you be sure to emphasize that these cycle lanes must be one-way/flow with traffic? It is not clearly marked in the images and although it *should* be obvious, I also personally think it’s obvious that existing painted bike lanes shouldn’t be used on the wrong/left side, going toward traffic/other lane users. I have seen cyclists use them the wrong way nevertheless. I usually try to offer a light-hearted “you’re going the wrong way!” rather than what I am thinking, which is “why are you trying to kill me?”. I believe some cyclists think of bike lanes as like sidewalks or paths (i.e., bidirectional), and I can’t blame them when confusing, poorly signed MUPs crop up such as the one along Fischer-Hallman near Highland that DOES allow both way cyclists…. Anyway, markings and signs please! Great point, that’ll help make the design clear. I do see one-way bicycle lanes potentially problematic in our current culture where all our separate pathways are free-for-all’s. Narayan, what’s your take on this concern? Yes, wrong-way riding is certainly a possibility, and it is an issue. Just this morning I was forced to play chicken with someone riding the wrong way down the bike lane on Keats Way. To emphasize that the lanes are one-way, I’ll update the image to show directional markings (bike symbols and arrows). Would separated lanes result in more wrong-way riding than on-street lanes? Probably. But I expect that the road markings (arrows) and the number of cyclists going the right way would make those counter-flow cyclists very aware that they are going the wrong way (and to not do it next time). The width of the bike lane should hopefully allow those few wrong-way riders to not impede people riding the correct direction. The wrong-way cyclists would therefore only be endangering themselves (at intersections), and not not anyone else. But that does raise the question of how people parked on one side of the street are supposed to get to the bike lane going the other direction. There would need to be places where people can cross the buffer into and out of the bike lane (maybe around where the trees are planted). @Narayan, speaking of intersections, could you explain how a left turn is done from these lanes? Is it like in Copenhagen, where to go left you go straight then point your bike left and wait for the next light/opportunity? If there are plenty of pedestrian crossings available, surely cyclists could switch to “pedestrian mode” to get across the street at a pedestrian crosswalk? Also there would have to be enough gaps in the foliage for car drivers to get to and from their vehicles. @ Kate – Regarding left turns, yes, that is correct. Looking at the diagram, you can see that southbound cyclists on King Street proceed to the left turn box on the left of the bike lane, where they wait for the green light on Erb (which is one-way eastbound here). 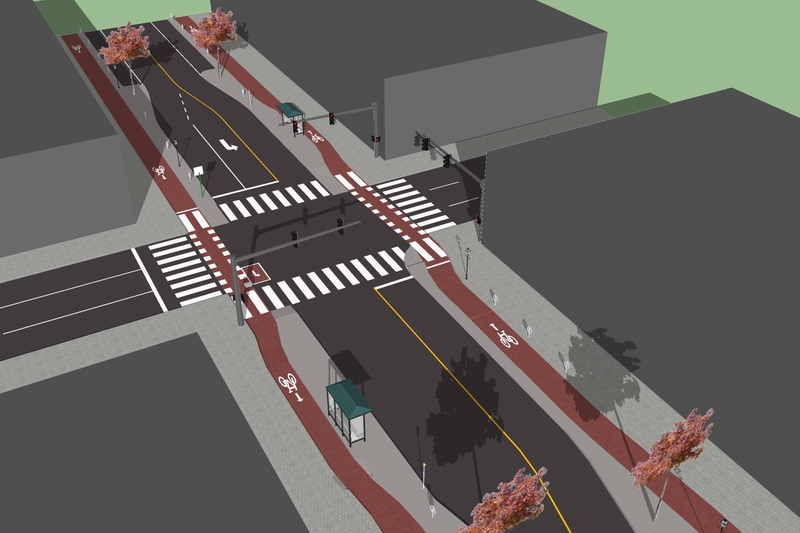 This design could make some people uncomfortable (standing in the intersection), but I figure that those people probably aren’t going to ride on Erb Street anyway since there is no bike lane in this segment. If we do add a bike lane to Erb, we would probably want to implement the Dutch-style intersection with protected left-turn waiting areas. I suppose it does make sense to accommodate all people crossing the street as pedestrians, to save space. But it is important to remember that ordinary pedestrians/drivers can just walk between parked cars, which might not be possible with the added width of a bicycle (or a wheelchair!). So we need to make sure there are plenty of pedestrian crossing opportunities with enough space for someone walking a bicycle. It looks great! Thanks for designing this – it was what was missing in the first proposal. Great with bike lane in different colour. My main worry is that it might create the same dangerous situation I’ve so often experienced as a pedestrian: cars failing to yield when turning right. Also it might increase this danger for pedestrians, as they would be (on the inside of the bike lane) less visible to drivers. Did you consider bike traffic lights with different phases, giving cyclists a head start? Or maybe let the cars turn first? Or do those intersections already have turn phases? (I’m confused about how this works.) I haven’t biked much, but I do walk a lot. Pretty much all the times I’ve nearly been hit by a car in KW as a pedestrian fit this pattern: I’m crossing on a white man and the car is turning right. Typically I’m on the right-hand side and the car is coming from behind me and turning on green, so nearly the same set-up as if I were biking and with a segregated bike lane, it would be identical. The driver has his head craned to the left, looking for a gap in the traffic – it’s not just a blind spot problem, but he’s not even looking in my direction! – and fails to yield to me. It’s not just a matter of waiting for the turning cars to pass before crossing, as more turning cars can appear at any time. There is no safe time to cross. The curved curb at the corners make it possible for vehicles to make the turn at speed. (A right angle corner would force them to turn more slowly.) Because of this I’m terrified of being right-hooked when biking – in particular I’m scared of large vehicles with large blind spots. I agree with Kate on the need to mark the direction – I have also seen cyclists use the lane on the wrong side of the road – but yes this could easily be achieved by painting arrows on the asphalt. As a pedestrian, I have never found the sidewalk on King too narrow. Maybe it is for people with mobility devices? Maybe it will be if more people start walking, but I still think that with no cyclists on the sidewalk, there would be enough space. As far as I understand, the main reason for widening it is to give businesses more outdoors space. In the areas that do have wide sidewalks but few pedestrians (The Boardwalk!) the main effect is to make the area feel deserted. @Line: The issue of turning conflicts is quite complex, but I’ll try to respond as succinctly as possible. You’re addressing the fundamental issue in the design of cycling facilities (and to a lesser extent, pedestrian facilities): dealing with the cars which cross the paths of pedestrians/cyclists. I think you may be mixing up right-on-green with right-on-red when you say “The driver has his head craned to the left, looking for a gap in the traffic – it’s not just a blind spot problem, but he’s not even looking in my direction!”. During rights-on-red, the driver is looking left since they are pulling into the cross-traffic stream which has a green light. But on right-on-green, the driver would never need to look left because there is no car traffic which crosses their path. The only conflict is with pedestrians and cyclists who are crossing the street to their right. Rights-on-red are indeed dangerous and I agree that they should be prohibited from cross-streets intersecting with King (Erb, Bridgeport, etc. ), because on top of the safety issue, vehicles would otherwise block the crosswalk and bicycle lane as they pull up to get a view of approaching cross-traffic. I would also like to point out that this is not a conflict which is “created” by moving cyclists off the roadway, it exists with on-street bike lanes too. In fact, the issue is even more severe on-street because the angle of conflict between cyclists and turning cars is such that cyclists approach right-turning cars in the driver’s blind spot. There is admittedly the option for cyclists of going around cars on the left using other traffic lanes, but this decreases the predictability of road users because different people will react differently to the same situation and cyclists could be anywhere on the road. 1. Normally, protected right turn signals are green at the same time as a corresponding left turn signal, while all straight-on (through) traffic is stopped. For example, northbound right turns are paired with westbound left turns. This allows protected right turn signals to be easily implemented with minimal impact to green times. But the major cross-streets in the study area (Erb and Bridgeport) are one-way so there is no corresponding left turn to the right turns off King Street. For example, at King and Erb, the northbound right would correspond with a westbound left, but there is no such turn because Erb is one-way eastbound. The only left turn off Erb is an eastbound left, which would correspond to a southbound right, which also doesn’t exist because Erb is one-way. A protected signal phase for right turns would need to have a red light for bikes/peds, but there would be nothing preventing cars from getting a green light. Cars would therefore get just as much (if not more) green time as today, but the green time for peds/bikes would be drastically reduced. This would be a very serious impediment to walking and cycling, and create negative public perception of segregated lanes, especially for cyclists who are already comfortable riding on the road. Those people will likely ignore the infrastructure altogether, continuing to ride on the road and enraging drivers, who would likely be unaware of the signal issue. Alternatively, the lights could stay red for through vehicles during this phase, but there would still be the issue of reduced green times for all directions since the number of signal phases would be increased from 2 to 3. 2. Separate right-turn signals require separate right-turn lanes, since there needs to be space to hold turning vehicles while other vehicles travel straight-on. Space is limited on King Street, so the value of separate phases must be weighed against other potential uses of the street width. 3. Speeds on King Street are fairly low, so the conflict between turning vehicles and peds/bikes could be fairly effectively mitigated through other methods, notably the street geometry. 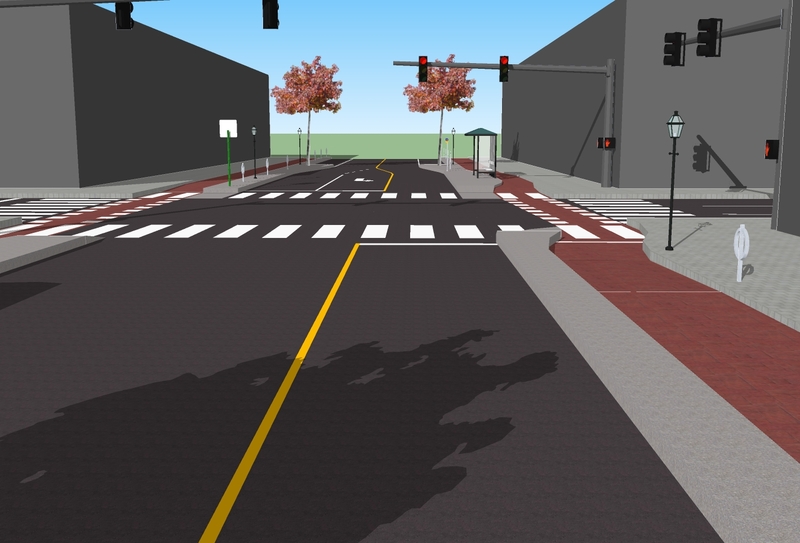 Small corner radii can ensure that vehicles turn slowly, and the bike lane location and buffer size can ensure good visibility for cyclists approaching intersections (as described in this post). Weighing the costs and benefits of protected signals I decided that protected signals would be detrimental overall to cyclists and pedestrians compared to mitigating the conflict through geometry. If, on the other hand, we were talking about a major suburban intersection like King and University, then protected turn signals would almost certainly win in that calculation because there are already turning phases, speeds are much higher and space is more abundant. I don’t think bicycles would have a measurable effect on the visibility of pedestrians. They travel at fundamentally different speeds, and even if a pedestrian is blocked from a driver’s view by a bicycle it doesn’t matter because the driver must yield to the cyclist anyway. This is so much better than the City’s proposal, and I hope they listen. But honestly, in either case, I would still rather ride with traffic down the middle of King. While your proposal is merely less convenient than riding with traffic, I think the City’s proposal is actually less safe than riding with traffic. In either case, would there be any law or bylaw forbidding me from using the road like a normal vehicle? Cyclists could theoretically be banned from the roadway if the city specifically introduces a ban on peds/bikes in the roadway (as is the case on expressways). But that would be incredibly unlikely since it would be completely against the intent of those bans, which is to keep vulnerable road users off roads which would be incredibly dangerous for them, and whose safe operation depends on relatively homogenous speeds (like the 401). Neither is true on King Street, so I can say with almost complete certainty that cyclists will not be prohibited from continuing to ride in the roadway if they desire to do so. But I’m curious about how it is more convenient to ride in the roadway rather than the cycle track (I’m always looking to learn and maybe improve the design). Are you referring to left turns? Both left turns, and reaching places on the opposite side of the street. The latter is significant over a stretch of road with so many cafes, pubs, bike shops, transit exchanges, and what not. The left turn box is nice but you need two phases of the light to get through. I know it’s a small thing but it would stick in my craw every time. I’m a little unclear as to how the sidewalks and pedestrian traffic figures into this plan. Is there anything separating bikes from pedestrians other than colored pavement? The sidewalk is raised from the cycle track.